The dust had barely settled on Fashion Week earlier this month when Burberry announced that Riccardo Tisci would be taking over as its Chief Creative Officer. After Christopher Bailey’s incredible 17-year tenure, the appointment of the former Givenchy designer at this most British of brands sent shockwaves through the fashion establishment.
.@burberry has just named Riccardo Tisci chief creative officer. That's one no one saw coming. For those wondering why Tisci’s new role is causing such a stir, the clues lie in his signature style – edgy and slightly Goth, with lashings of streetwear credibility – as well as the kind of customer he attracted during his 12 years as Creative Director at Givenchy. Celebrity endorsements are, of course, key to boosting brand awareness and Tisci’s come from a younger, more diverse crowd than Burberry’s. Famously, Kim Kardashian tasked Tisci with creating the dress she wore for her 2014 wedding to Kanye West, while his couture dresses are Red Carpet staples worn by the likes of Cate Blanchett and Beyoncé. The disparity between this and Burberry’s more conventional, heritage-led clothing suggests change is in the air. Burberry is used by many as a case study for digital transformation. The brand was the first to live-stream its shows on Periscope and Snapchat, and pioneered the ‘See now, buy now’ ecommerce trend, allowing customers to purchase looks directly off the catwalk. This was enough to rank Burberry top of 83 fashion brands in L2’s 2015 Digital IQ Index. However, despite providing more opportunities to purchase, pre-tax profits fell 10% in 2016 and 5% during 2017, with much of this decline attributed to falling demand from Asian markets. 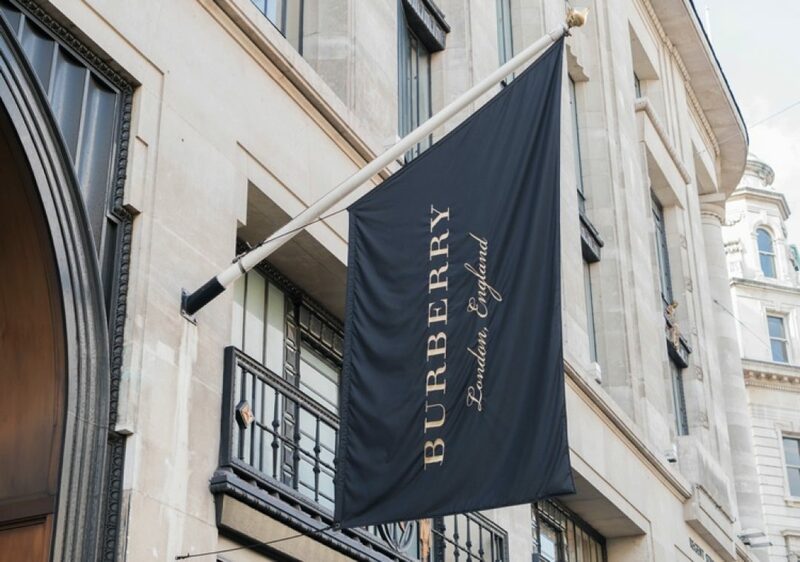 Burberry’s new CEO Marco Gobbetti (who previously worked with Tisci at Givenchy) has affirmed the brand’s need to move further upmarket and become the go-to retailer for luxuriously British clothing. This strategy could certainly win over High Net Worth audiences in Asia, where fashion is used less for self-expression than as a tool to enhance reputation and personal image. 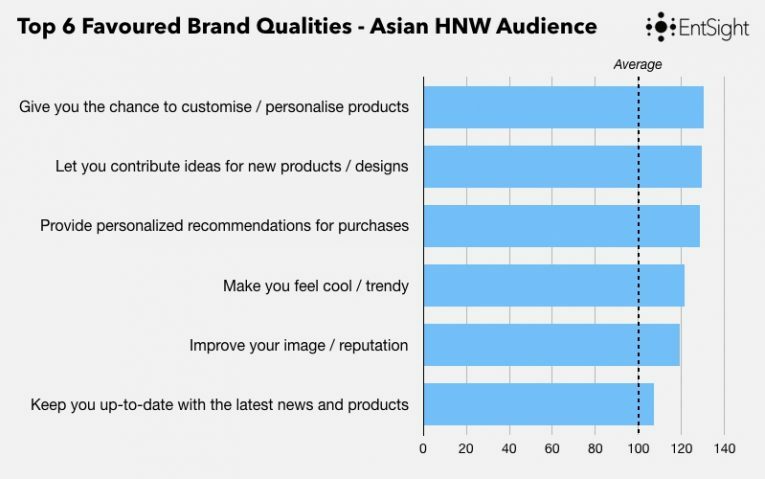 GlobalWebIndex data reveals that Asian HNW consumers over-indexed by 22 percentage points vs. the average consumer for wanting a brand to make them look ‘cool / trendy’. There’s some evidence that Givenchy is winning over these audiences in China, building on a legacy of influencer outreach and ecommerce innovation established during Tisci’s tenure. Indeed, Givenchy is the fifth most successful luxury brand among key opinion leaders in China, according to data from consulting firm R3 Worldwide and Bomoda. This is valuable experience to apply to Burberry’s operations in the region. China’s importance as a market for luxury fashion is also illustrated by website traffic. While Burberry’s site is more effective at converting customers, thanks to the brand’s digital-first approach (ranking 238th among global fashion ecommerce sites in February compared to Givenchy at 1,126th), Givenchy attracts a higher proportion of traffic from China at 9% of total site visitors. This is three percentage points higher than on Burberry’s website. Clearly investors were won over by Tisci’s track record: Burberry shares rose 5% after the announcement. 9% of positive reactions immediately following the March 1st announcement referred to feeling “excited”. A further 14% of this conversation offered congratulations to the new Chief Creative Officer. Fashion enthusiasts were keen to see Burberry become more ‘High Fashion’, gaining closer parity with Givenchy customers. Examining the profiles of individuals who follow Givenchy’s social media presences and discuss the brand online, 22% have a committed interest in fashion, five percentage points more than Burberry’s online audience do. Similarly, a huge 56% of Givenchy’s audience work in creative professions, compared to 42% of Burberry fans, underlining the more exclusive niche that Tisci’s designs have penetrated. Overall, 12% of all earned conversation was positive in tone, compared to just 1% that was critical. 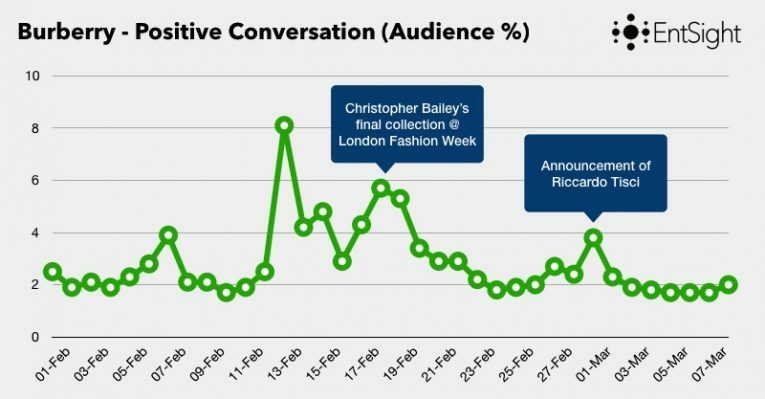 This uptick in positive brand sentiment, however, did not compare to the outpouring of affection for Christopher Bailey as he unveiled his final collection at London Fashion Week on February 17th. One of the biggest criticisms of the move was in connection with the game of ‘musical chairs’ played by the fashion industry. Several consumers lamented that the same group of designers circulates around the major fashion houses, preventing fresh talent from making a mark. Highlighting this, former Louis Vuitton designer Kim Jones and Phoebe Philo, who stepped down as Creative Director of Céline earlier in 2018, were referenced alongside Tisci in more than 300 mentions as fashion insiders speculated on where these remaining designers would end up. Tisci’s links to celebrities were also a source of distaste for some. Kim Kardashian and her model sister Kendall Jenner attracted mentions in 2% of all discussion around the Burberry appointment, used by sceptical fashion enthusiasts to illustrate Tisci’s poor fit for the job – e.g. “How long before Kim Kardashian is fronting the Burberry campaign? Yuk. What a nightmare”. Looking to the future, there several directions Tisci’s Burberry career could take. At best, Tisci will reinvigorate the brand, interpreting Burberry’s British identity for a new breed of global HNW consumers. At worst, it could be a mismatch that costs Burberry the accessibility and digital supremacy it gained under Christopher Bailey. Either way, it will be one unmissable ride.